Fashioned of solid mango wood, with front doors featuring an aged bronze finished metal inlay in a modern geometric pattern. An ultimate entertainer and a stunning conversation piece. This exceptional cabinet is fashioned of solid mango wood, with front doors featuring an aged bronze finished metal inlay in a modern geometric pattern. A large open prep area treats company to cocktail hour and two smaller pullout surfaces are perfect for snacks, nibbles or an impromptu food pairing. 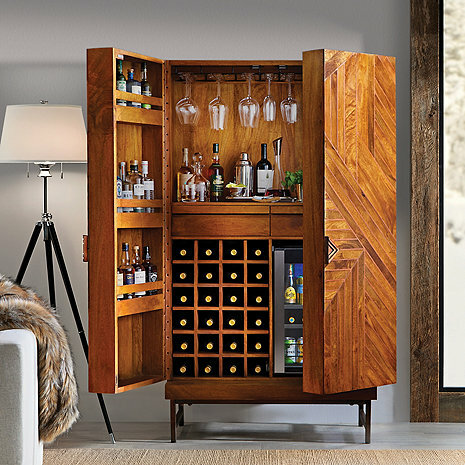 Features 24 individual wine bottle slots, a hanging stemware rack, 2 drawers to hold barware accessories and deep shelving in doors for additional bottle storage. Solid mango wood is finished in matte cognac. Dimensions for the both closed and open? BEST ANSWER: The Cheverny Metal Inlay Bar Cabinet closed dimensions are as follows: 40 inches wide by 22 inches deep by 72 inches high. The doors are both 20 inches wide and the large open prep area extends out 22 inches. Where is this bar made? what is suggestion for proper care of the mango wood? Can you remove the wine bottle slots? BEST ANSWER: The Cheverny Metal Inlay Bar Cabinet has slots for your wine bottles to be stored which cannot be removed. My unit that was delivered today has a wine bottle grid that is in fact removable. This is is a beautiful piece to add to our game room. It makes a very nice statement to the room, very solid construction and we have received several positive comments when people walk into the room. Looks great closed or open. We did not include the beverage refrigerator to be able to use the space for extra storage. Note that some odd shaped or large round liqueur bottles will not fit in the doors. I was surprised that the bottom shelf on the left (seen in picture) and a large area on the right door does not include shelving. This is space that could otherwise be used for bottle storage. Unless the unit has a slight backward lean toward the wall, the doors do not stay fully opened. These are all minor complaints. we do love the look and function of the unit. Also, strongly recommend the premium delivery to get into you home and removed from the packaging. This is a heavy and awkward unit to move. This is a beautiful piece with tons of storage. Well made and lots of character. The wood chevron inlay with the bronze sets a mid century tone to our eclectic space. We went without the fridge and are now looking for extra wine storage inserts. This is a beautiful cabinet. However, please be aware that it is huge and heavy! This is heavier than my refridgerator (we have moved both), and as deep as a kitchen cabinet. Be sure you have the space for it!